So wrote an anonymous poet in the Bromley Record when rumours of redevelopment threatened Martins Hill. This was a realistic fear since parts of the hill had already been sold off in 1858 to Mayor William Starling, who built for himself Hill House later to be used by the Territorial Army, as well as the speculative developments The Hollies, and Glebe Knoll which is now a locally listed building. Owned by the Church Commissioners, the Hill was finally purchased by the town in 1878 and set out as Bromley’s first recreation area. In 1887, in celebration of Queen Victoria’s jubilee the lower slopes of the Hill were acquired together with the meadow which was renamed Queens Mead. Threats to Martins Hill continue to arouse passion, for example when the Council’s recreation department proposed a dry ski slope here in 1983. The proposed desecration of the hill was met with howls of local protest resulting in the scheme being dropped. This affection for the Martin’s Hill is well deserved. It is not only a fine swathe of real Kentish countryside, just a minute from the heart of the old town but also offers wonderful views towards the Keston ridge and Crystal Palace. Equally important it is here that the wild Broom, the yellow flowering shrub from which Bromley takes its name still grows. “It may be reasonably inferred that in prehistoric times the whole district in and around the modern town of Bromley was covered by woods and undergrowth. 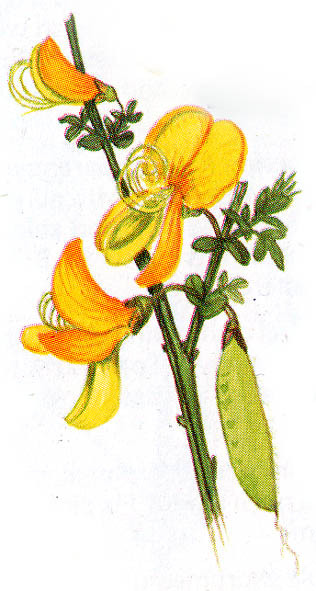 Very conspicuous among its flora was the common broom, and from this feature of the landscape the name Bromleag, or, in Latin form, Bromlega, was ultimately derived, meaning the heath where the broom grows. “(ELS Horsburgh- History of Bromley 1928). Another local historian, Charles Freeman writing as early as 1825 noted that Martin’s Hill was wholly or partially covered in broom but that elsewhere “few vestiges of this broom, however, are now remaining, most of the ground having been taken into cultivation”. By the beginning of World War 2 it had disappeared even here. However in the early 1980’s several sprigs of broom were noticed on Martin’s Hill just two minutes walk from Market Square. The mystery of why the broom returned to the hill has only recently been resolved. A council officer recalls that on the occasion of a royal visit to Bromley broom was planted in various places along the route. A few plants left were over and these were put on Martin’s Hill. Being back in its native habitat the plants must have set seed and flourished to the point where it has established three sizeable colonies with other new sprigs growing elsewhere on the hill. Now during late April and early May it makes a spectacular show worth celebrating. The slopes of Martin’s Hill are ecologically defined as ‘acid grassland’. While currently somewhat degraded this habitat is mentioned in the borough’s Bromley Biodiversity Plan and is of regional importance. It has therefore been designated as a Site of Importance for Nature Conservation (SINC). In recent years clumps of bramble have begun overwhelming the Broom and other locally unusual lichens—along with fine-leaved grasses such as common bent and fescues, and typical herbs such as sheep’s sorrel, tormentil and heath bedstraw. Working with the council contractor, and other parties, we intend to improve its ecological diversity. Geologically the upper slopes are on the Blackheath Beds while the lower slopes are on clays. At various points where they join ground water can reach the surface in a number of small springs. While it is an unfenced natural area, open 24 hours, there are a number of features. War Memorial. At the top of the slope near the Church Road entrance. It recognises those Bromley inhabitants who died in both world wars. It was designed by the notable British sculptor Sydney March, who also designed the National War Memorila of Canada. The site of the annual Remembrance Sunday service. Colourful formal flower beds surround the memorial. “Field of Hope”. 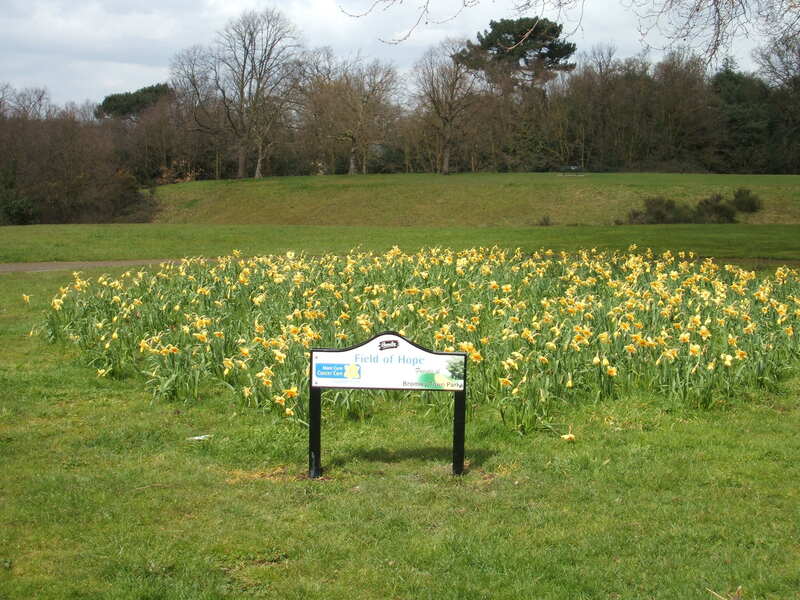 Every spring about 2,000 daffodils make a fine display adjacent to the War Memorial. These were planted by members of our Friend’s group in 2005 and in subsequent years and celebrates the work of the Marie Curie Cancer Care charity. Woodland. Glebe Wood can be found on the northern edge of the site and bounded on one side by a former drove road. Now a charming track, in the past it was used to drive animals up the slope to market in Bromley Market Square. The wood has a mix of tree species, many mature specimens, including much holly. In the glades cleared to date bluebells can be found in the Spring. We are working to improve access to this wood and its formerly hidden features. Children’s play area. A fenced area containing slides, swings, climbing frames etc. with protective surfaces can be found on the lower slopes. The play equipment was updated in 2013. Activity circuit. The slopes, along with adjacent Queen’s Mead, is used by local joggers and other people interested in healthy lifestyles. River Ravensbourne. Divides Martin’s Hill from adjacent Queen’s Mead.